In Virginia there is a Lemon Law on the books to protect consumers who purchase a car which is later found to have serious defects. However, there is no such law when it comes to protecting buyers when they are purchasing a home. "Bargain" homes at first blush can look to be outdated but in decent shape. However sometimes when you start to look a little deeper you can start to uncover more serious issues. Buyers in today's market who are focusing their search on foreclosure properties are the latest buyers who may find themselves caught in the newest version of the Money Pit. Buyers who don't have strong handman skills or deep pockets need to understand what they are getting into when buying a foreclosure. Banks rarely make any repairs and with properties with all of the utilites off making even a cursory examination of the appliances, plumbing or air condition is impossible. Most buyers are given the option to have a home inspection "for information purposes" but that phrase doesn't give you an out in your contract. For buyers who are working directly with a private seller the option for a home inspection is front and center. The home inspection can give you peace of mind and the opportunity should you find serious defects in the home to walk away from your contract. This is a rare occuarance but let's face occassionally we do find lemons and no matter how hard we try we can't make lemonade out of them. When that happens the ability to void the contract is well worth it. So as you are out looking at homes to buy in Northern Virginia you need to look at the whole picture. If your "bargain" foreclosure property is going to set you back $50,000 in repairs is it really a bargain? If you spend a little more you might be able to give yourself peace of mind by knowing more about the biggest single expenditure you might make in your life. Make sure you are looking beyond the lower price and at how you might be spending your weekends for many years to come. 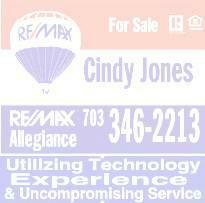 If you are interested in exploring your options in Northern Virginia give me a call. I'll help you make an informed decision about your new home purchase. Hi Cindy, I personnally look at bargain forclosures as gamble with risk potentials. Think of it as buying a used car at the auction. It is simply not for everyone if you get what I mean. Your article on urgining buyers of foreclosure properties to have an inspection even though the repairs probably won't be covered by the seller is right on target. Today we had a regional meeting sponsored by our company's legal team. The topic was short sales and foreclosures. For sure, spending $300-$500 for inspections is far more advantageous that buying a "lemon." Cincy, can you imagine what a Lemon Law for a home would look like? Especially in Virginia where the basic disclosure laws need to play catch-up!